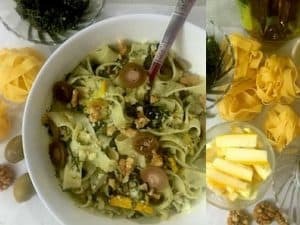 I have not made pasta with rotini before and I had to look it up in Wikipedia to see how it was different from fusilli, but am no wiser as there are contradictory explanations in Wiki’s definition! 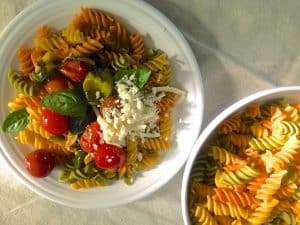 However I do agree with the statement that the curly spirals of the rotini pasta retains the sauces and is suitable for the burst cherry tomato sauce in this recipe. I had delicious spaghetti with burst cherry tomatoes and garlic for dinner one evening when we visited St. Michaels on the Chesapeake Bay last month and I must try that out soon too.While I usually prefer long pasta such as spaghetti or fettucine, today the little spirally tricolour rotini in the Rotini Pasta in Garlicky Burst Cherry Tomato Sauce, complemented the red yellow brown and green coloured tomatoes that we picked up at the local Farmers market on Saturday. As the garlic cloves were large, I sliced them thin and long and minced the fresh basil leaves from the garden. Small garlic cloves may be added whole without slicing. I also added some sliced green pepper with the lady at the farmers market informed me would taste smoky after cooking. 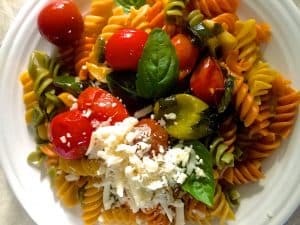 The best part of this Rotini Pasta in Garlicky Burst Cherry Tomato Sauce recipe was that it is so quick and easy to make and quite effortless too. It has earned me brownie points with my granddaughter Tamanna who says its ‘yummy’, high praise from this 5 year old little gourmet! Cherry tomatoes are not just juicy and tasty, they have all the health benefits of the regular tomatoes. 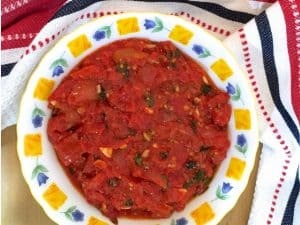 Chock full of Vitamins A and C, they also have Lycopene which is considered beneficial in fighting prostate cancer in men. You might like to read more about this in this article from Harvard Health, here. Add the pasta, stir. 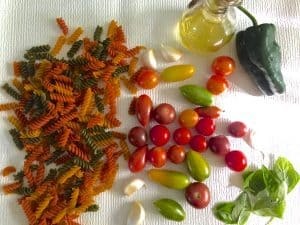 Allow to boil till the pasta is al dente (usually between 8 -12 minutes). Mine took 10 minutes. 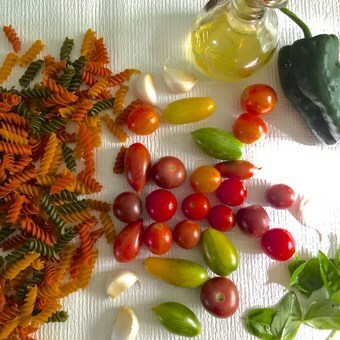 Heat olive oil in a pan large enough to be able to mix in the pasta after it is cooked. Add the garlic, sauté for about 2 minutes, stirring frequently till the garlic begins to brown slightly. Add the basil leaves, stir. Add the sliced peppers, stir. 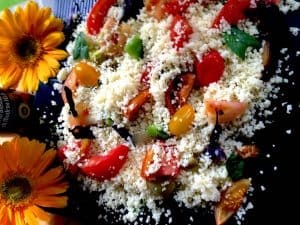 Add the cherry tomatoes whole. Add sugar and salt. Stir. Cover and cook for about 8 minutes, till you see the tomatoes bursting out of their skin and the juice oozes into the garlicky oil. Stir. Taste and add more seasoning if required. Add the cooked and drained pasta, stir till it is covered with the oily sauce. Remove from the stove and transfer to individual serving portions. Serve hot. Add grated parmesan, seasonings and fresh basil. 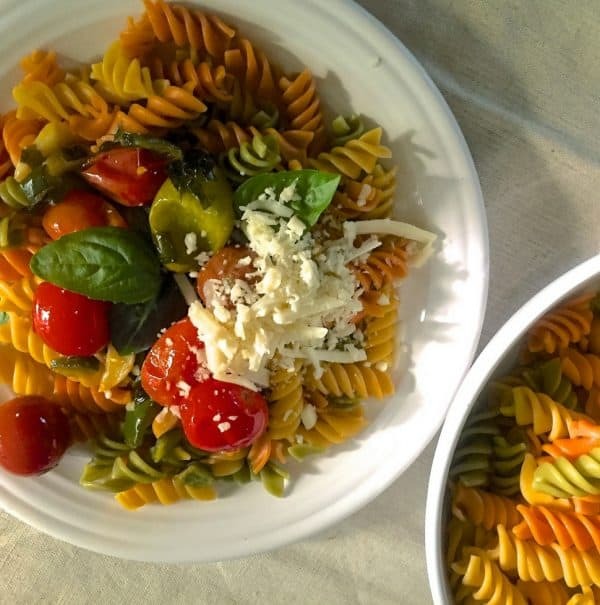 Enjoy your quick rotini pasta with garlicky burst cherry tomato sauce! This sure sounds easy to make!